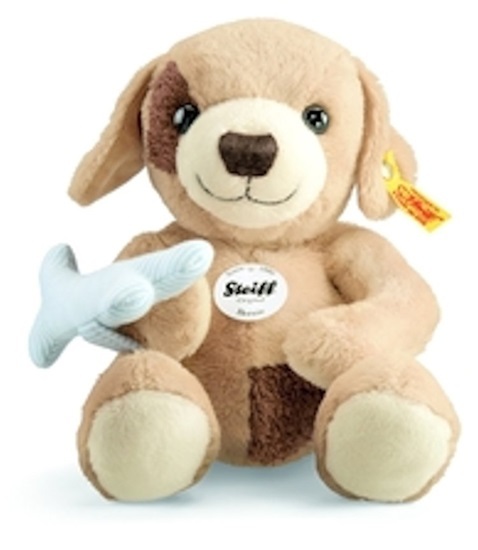 New from Steiff, we are pleased to share "Bernie" the dog. This is an 11-inch soft brown plush dog, with a dark brown patch over his right eye, and another dark brown patch on his lower left tummy. He has white paw pads, and is stuffed with synthetic filling material. His nose and mouth are sewn-on, and he has safety eyes. Of course, every dog has to have his bone, and Bernie is no exception, in his paw, he holds and dark blue and light blue striped soft plush bone. Bernie is machine washable up to 86F, and is good for ages 4 and up.